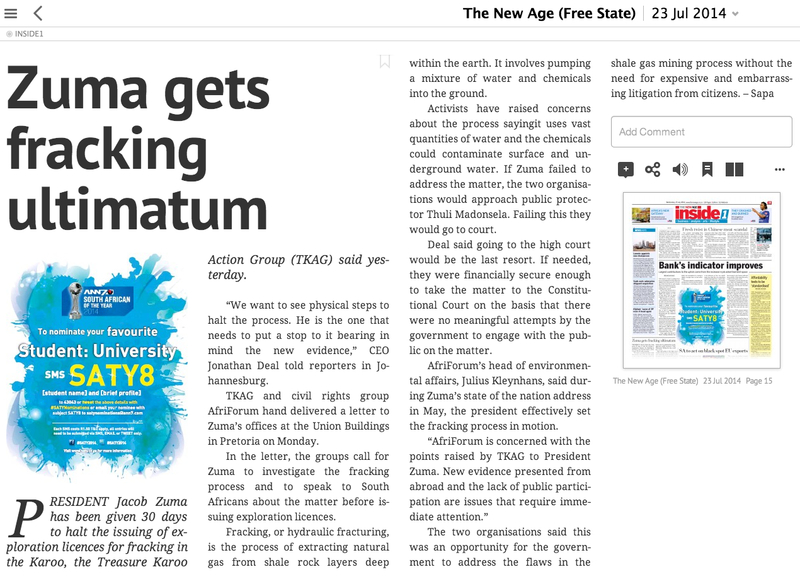 Well done to TKAG and Afriforum for standing up to the government and the oil companies on this critical issue. This process is known to be extremely damaging to the environment, while the profitability is very questionable. Considering the devastation caused to ground water reserves and other negative impacts like methane leaking to the atmosphere and 24 hour a day heavy truck convoys, fracking is altogether an extremely negligent option. The pristine water resources in the Karoo will be poisoned for generations, if not permanently. What will happen to the millions of litres of toxic waste from drilling of each well, no doubt this will be dumped on the land of some unscrupulous farm owner, or into the nearest stream, to cause further damage to groundwater. Mr Zuma, lets stop playing around with fossil fuels, we already have solar power installations up and running, they are quick to install and can be located next to points of consumption if required, doing away with thousand of kilometers of copper transmission lines. Mr President remember your pledge to reduce greenhouse gasses, fracking is turning out to be probably a worse emitter of greenhouse gas than oil, in spite of what the oil companies would have us believe.